This high-performing design showcases Black Rhodium's cutting-edge vision with deep cryogenic treatment and Crystal Sound technology, to deliver a natural and expansive sound. Black Rhodium Phantom DCT++ CS XLR Interconnects offers a stunning performance thanks to its deep cryogenic treatment and the brand's exclusive Crystal Sound process. This combination ensures a clear and intricate sound performance. The twisted two cord cable is manufactured in England according to the brand's exacting manufacturing process so you can be assured of its excellent quality. 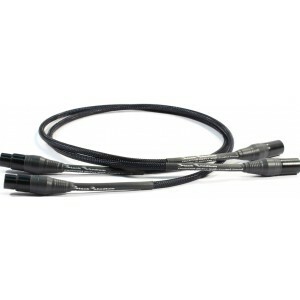 These interconnects are terminated with high-quality gold plated Neutrik XLR connectors. An improved clarity of sound is offered by silver plated copper conductors, while a more transparent beat and rhythm is delivered by low loss PTFE inner insulation. Alongside this, a unique low microphonic noise layer creates a more organic sound quality. The silver plated copper braided screen removes noise and interference, while the high-calibre quality control of the wire direction in the assembly process provides you with consistent stereo imaging and reduced background noise. What's more, the cord is tightly twisted for superb noise rejection. In addition to DCT++, the Phantom DCT++ CS XLR Interconnects are also treated with the Crystal Sound Process. The Crystal Sound process is applied to the cable after the completed DCT++ process and works to refocus the most external conductor skin. As a result, the surface of the conductor closely packed and uniform, with a continuity which helps conduction.With the Crystal Sound process, bass notes are demonstrably enhanced and the overall sound clarity is improved. Black Rhodium Phantom DCT++ CS XLR Interconnects are enhanced with Black Rhodium's pioneering DCT++cryogenic processing treatment.This process involves processing temperature both above and below room temperature. The DCT++process edits the molecular structure of the cable in order to improve uniformity. This brings long-lasting benefits and quite simply, improves every aspect of the cable's performance.